Huntsmen Spiders of the family Sparassidae are some of the most efficient hunters on the planet. 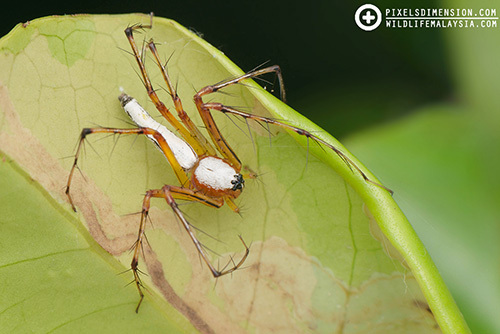 They resemble Crab Spiders in that their legs are “arranged” in a manner that allows them to move sideways like crabs; this unique positioning also allows these spiders to hide effectively in small crevices or lie flat on tree trunks. Huntsmen Spiders are some of the fastest spiders around and their large sizes may be frightening to most. 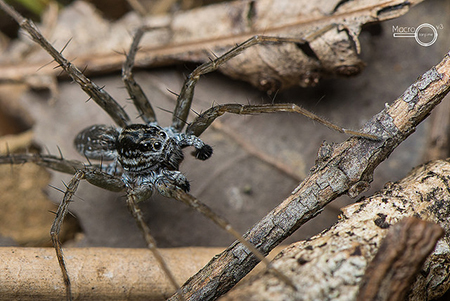 These spiders have eyes that are arranged in two rows of four, and mostly hunt at night. #1. 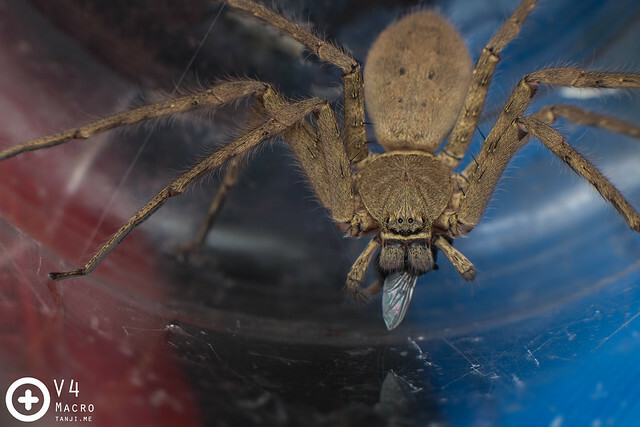 A large, female Domestic Huntsman Spider (Heteropoda venatoria) feeding on a blowfly. 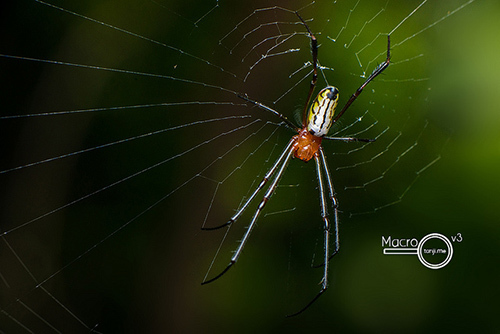 This is one of the most common and successful huntsmen spiders originated from China. They are often found on buildings or gardens in or near human settlements at night. #2. 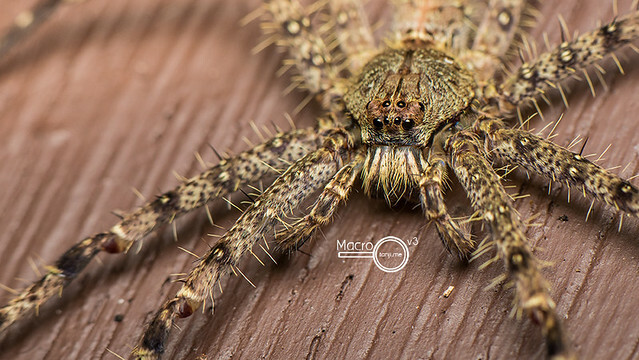 A Lichen Huntsman Spider (Pandercetes sp.). 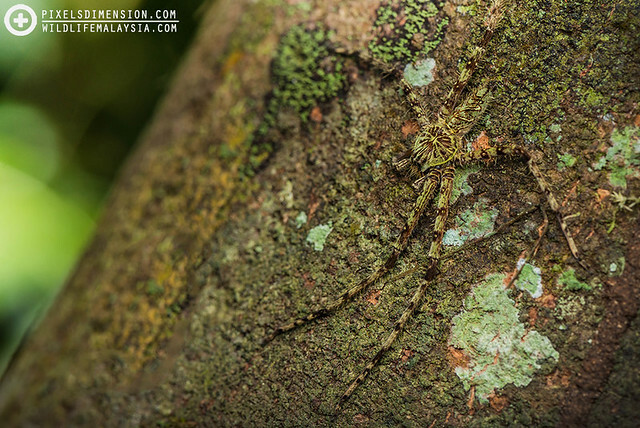 These beautiful spiders are often very well-camouflaged on tree trunks covered with lichen and moss. 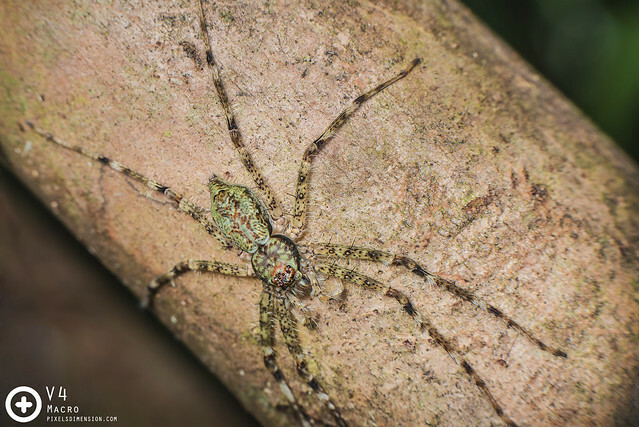 Some tree-dwelling Huntsman Spiders are so well-adapted that some may spend most, if not the entire lifespan on trees. #3. 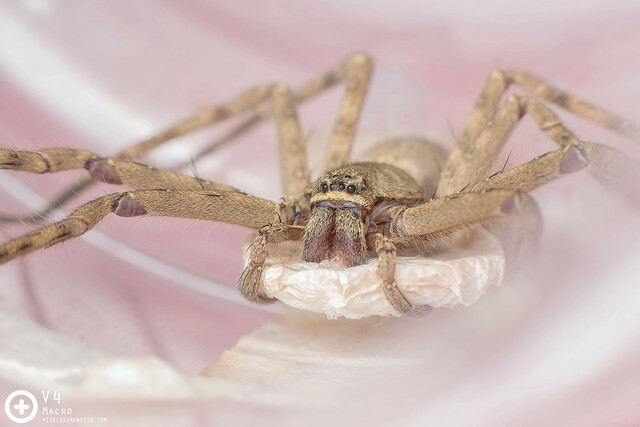 A mother Domestic Huntsman Spider (Heteropoda venatoria) guarding her egg sac. Huntsmen Spiders are known to be very protective of their eggs, at least until the spiderlings are hatched and are ready to disperse. 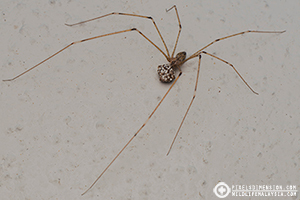 The mother will go hungry and thirsty for many days while protecting the egg sac containing the next generation of Huntsmen Spiders. #4. 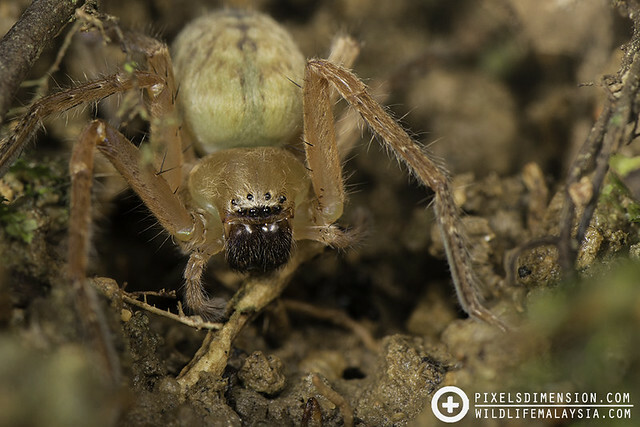 A female Lichen Huntsman Spider (Pandercetes sp.). 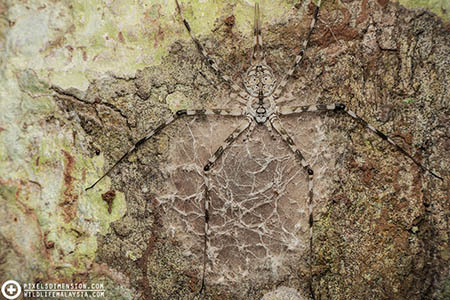 Lichen huntsman spiders are always a magnificent sight due to their immense size, brilliant patterns and colours. Freshly moulted lichen huntsman may show lighter colours and seen in this photo. 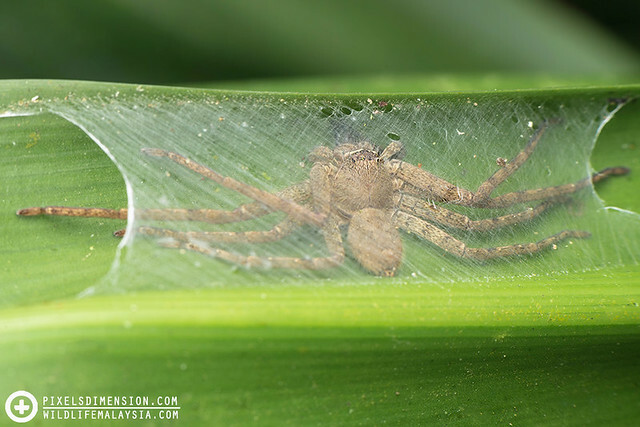 Note how flat the spider while resting? This is one of the reasons why they are so hard to notice out in the wild. Lichen Huntsman Spiders are almost always found on tree trunks, but some may venture onto foliages occasionally. #5. A hungry female Domestic Huntsman Spider (Heteropoda venatoria). This hungry huntsman spider decided to go out hunting during the day, found another spider’s nest and decided to attack! At 20x larger, the prey didn’t stand a chance against the huntsman. #6. A female Giant Tree Trunk Huntsman Spider (Heteropoda cf. boiei). 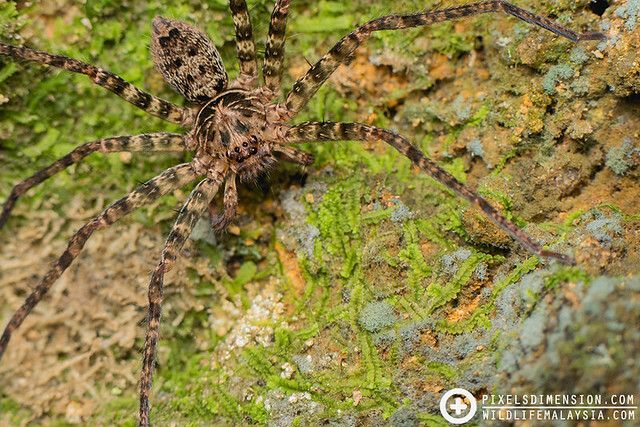 These large and hairy spiders are often found on tree trunks as well as walls of old buildings, waiting for their favourite food- roaches! #8. 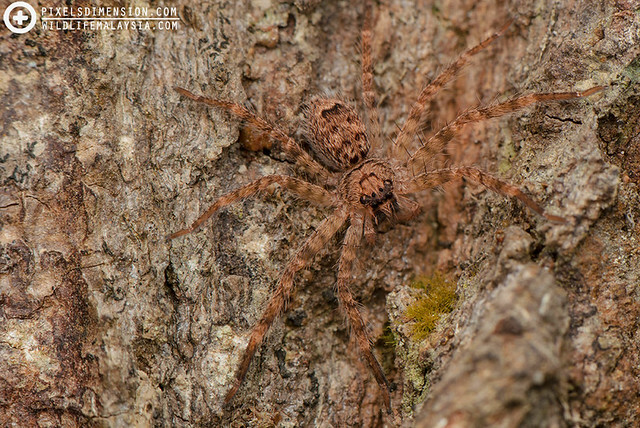 A male Giant Tree Trunk Huntsman Spider (Heteropoda boiei). This large and beautiful huntsman spider may be partially legless, but it is far from being helpless. 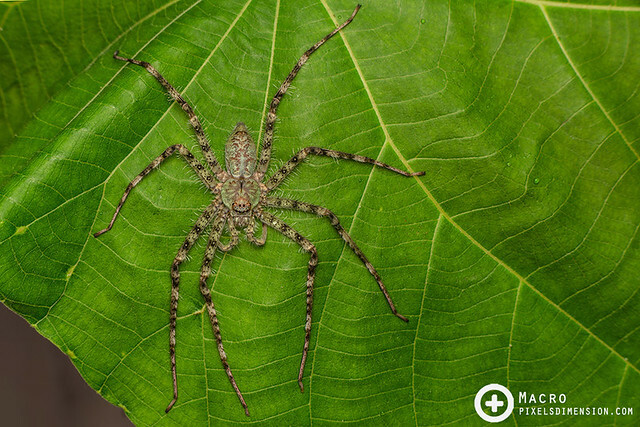 Despite still being able to move at great speeds, the spider prefers to press his body onto the tree trunk, making it extremely hard to detect! #9. Huntsman spider (Heteropoda sp.). This huntsman spider was waiting for prey on some patches of lichen during the day- must be real hungry. Despite this, it was still rather difficult to spot it! #10. A different group of huntsman spider (Olios sp.) from the usual Heteropoda and Thelcticopis. These spiders appear to have anterior median and anterior lateral eyes that are more or less the same size. This particular one was hiding among foliage in her silk retreat before making a run for it when disturbed.